Un écrivain doit connaître son public et apprendre à écouter ce qu'ils veulent. J'ai remarqué que quand je poste une recette qui est frit, décadent ou plus rarement, un dessert, il reçoit beaucoup d'attention et de commentaires. Quand je poste une recette qui est plus sain, it gets some attention but less than the fried food. When I post an essay or review, it gets the least attention of all. But even though fried foods get the loudest response from my readers, salads are pretty popular too. Now that it’s Spring and the weather is warmer, we are all going to be eating more salads. 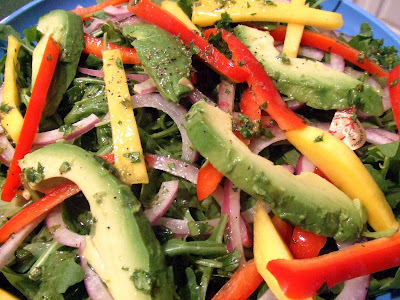 This salad is not only healthy, it’s super-colorful and beautiful. Creamy green avocado, sweet yellow mango, spicy arugula topped with a zingy dressing of cilantro and citrus. I like this salad because it just looks….bien, it looks happy! It looks like warm weather, fun and smiles – all in a healthy, compassionate package. Serving this salad is guaranteed to induce good moods…and maybe help me feel better that my audience loves me more for my recipes than my thoughts. I guess the way to an audience’s hearts is through their stomachs. Jouir de! Mix all ingredients in a bowl and whisk until incorporated. Place arugula on serving platter or in salad bowl. 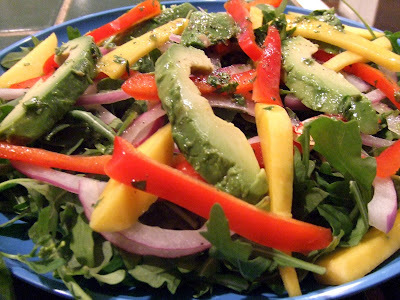 Top with slices of avocado, mango, onion and peppers. 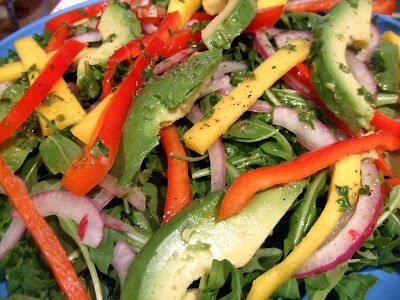 Drizzle salads with dressing just before serving. Toss and serve. How many people does this serve? I would like to use it for entertaining, but not sure if I should double it for 10 personnes? Hi Maggie, this serves about 4 people as a side salsa. Pour 10 personnes, I would double or triple it! Southern Purple – sensationnel, wish I had a garden full of cilantro! Naomi – yes it would. Bonne idée! Sherry – hope you’re not commenting with your mouth full. Il a été. Merci beaucoup! I’m eating this right now…OH,WOW, this is fabulous! Sounds great Rhea and it would make a great Pesach meal too! Wow that looks super good, I am going to have to make that dressing. I have an over supply of fresh cilantro from the garden.